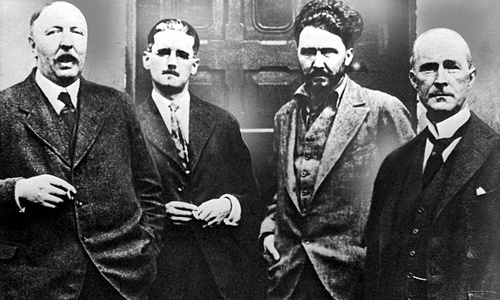 Ford, James Joyce, Ezra Pound and John Quinn (lawyer and modernist collector). As you’ll have seen in my previous post, there are a couple of authors with whom I’ve become particularly associated. Richard Aldington knew Ford Madox Ford well through the London modernist networks of the early years of the twentieth century. I find Ford a fascinating author. He loved storytelling, even at the expense of fact, which makes all the more impressive the achievement of Max Saunders in unpicking Ford’s life in his exhaustive, magisterial two-volume biography. Christopher (Benedict Cumberbatch) and Sylvia Tietjens (Rebecca Hall) in the BBC/HBO Parade’s End (2013). You might, perhaps have come across Ford in recent years if you’re a Benedict Cumberbatch fan – the big, shiny BBC/HBO miniseries (2013) of Ford’s great war novel tetralogy Parade’s End (1924-8) was striking and successful, scripted by the eminent playwright Tom Stoppard. (You can watch it via Box of Broadcasts.) Stoppard did a good job of adapting 840 pages of four novels into under five hours of prime time TV, although necessarily some liberties were taken. For example, Ford’s ending looks forward after the Armistice to an uncertain but hopeful future, while Stoppard ends, perhaps too neatly, with the fevered celebrations of Armistice night. It was, of course, my interest in the First World War that brought me to Ford and Parade’s End; I’ve a chapter on Ford and War in An Introduction to Ford Madox Ford, and he features in my book, too. 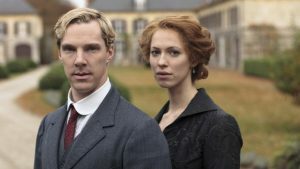 The series tells us the intersecting stories of the protagonist Christopher Tietjens, his wife Sylvia Tietjens, his inamorata Valentine Wannop, and his brother Mark Tietjens. The characters represent the push and pull in the years between circa 1912 and 1920 between insistent mechanisation and modernisation, and older moral and ethical values that are coming to seem outdated. Christopher Tietjens insists on doing what he believes the morally right thing, even despite the potential damage to his own reputation and other practical considerations. The Parade’s End novels use a form somewhat akin to stream of consciousness, although there are multiple consciousnesses represented. The narrative moves associatively between different protagonists and moments in time; these chronological changes are highlighted clearly in the recent Carcanet critical edition, which makes following the shifts easier than in the longstanding Penguin editions. The Carcanet critical edition of Parade’s End. I’m secretary to the Ford Madox Ford Society, which has a (usually) annual conference – I was sad not to be able to go this year, particularly as it was held in Montpellier! The society also produces a number of publications, including collections of critical essays, and senior members were responsible for the Carcanet Parade’s End and other reprints by that publisher. Parade’s End is quite difficult as an introduction to Ford. His other very famous novel is The Good Soldier (1915), but for some alternative choices, why not start with his social commentary about England and the English (1905-7) (vol. 1 and vol. 2 available for free online), or his fascinating psychological novel A Call (1910)? Let me know if you read any Ford, or would like to write about him!